Abetalipoproteinemia (ABL) is a metabolic disorder, meaning that it affects the body's ability to use food and/or perform chemical reactions that are necessary for life and health. Diabetes is an example of a metabolic disorder, as it interferes with the body's ability to maintain normal levels of glucose in the blood. There are many disorders in this group. ABL is	also called Bassen-Kornzweig syndrome. Note that ABL is somewhat more common among people of Ashkenazi Jewish origin (see link to Jewish Genetic Diseases website in our list of support groups). The first clinical signs of ABL are usually gastrointestinal. They often begin to show in early infancy, and include diarrhea, steatorrhea (fatty stools), and failure to thrive. Unfortunately, these signs are non-specific and can be caused by a variety of different conditions, which complicates diagnosis. As a result, some patients may not be diagnosed until the appearance of neurological or vision problems. Neurological abnormalities typically begin with loss of reflexes and sight abnormalities with deterioration of night vision. ABL may be discovered during routine blood testing in a patient with no symptoms (2). The most common signs and symptoms of ABL are listed below. A common facial appearance has been reported in a small number of patients (3-5), but it does not appear to be a typical feature of ABL. Acanthocytosis is a condition in which red blood cells become malformed (see photograph on this page). The cells look thorny or star-shaped. This abnormality is caused by abnormalities in the composition of red cell membranes (2). There are two main strategies used in treating ABL: 1) supplementation with vitamins A, E, and K and 2) careful control of fat intake. Vitamin D is also fat soluble, but opinions differ on the need for vitamin D supplementation in this condition. One recent review recommends it (6) and another says it is unnecessary (1). Monitoring for vitamin D deficiency and supplementing if necessary can address this point in individual patients. Vitamin supplements. Vitamin supplementation is critical to maintaining health and preventing neurological problems. Vitamins are also critical for maintaining sight. They can diminish the severity of eventual vision loss, and may even prevent it. ABL patients who do not take vitamin supplements will develop progressive neurological abnormalities; these problems will have severe effects on quality of life and will shorten life. Note that very high doses of oral vitamin E are required in order to obtain normal levels of vitamin E in the serum. These doses are on the order of 100 - 300 IU per kg of body weight per day (6). Vitamin E toxicity has not been reported in ABL patients to date. This is thought to be due to very low absorption of vitamin E. Levels of this vitamin should be measured regularly to evaluate the effectiveness of treatment and adjust it accordingly. Vitamins A and K can be given in lower doses. A water-soluble form of vitamin A is available. Restoring levels of these two vitamins to normal appears to be easier than is the case for vitamin E. Vitamin A toxicity has been reported in one patient (7). Thus, as a precautionary measure, patients receiving vitamin A supplements should be monitored for signs of toxicity. It should be remembered that the likelihood of toxicity from vitamin A suppplementation appears to be far lower than the likelihood that serious problems will develop due to lack of vitamin A. Diet. A low-fat diet is the second pillar of ABL treatment. The aim is to reduce fats to <30% of total calories, with a particular emphasis on cutting out long chain-fatty acids (2, 6, 8), which are found in meats, milk, eggs, and most vegetable oils. Coconut oil contains medium-chain fatty acids; however, patients should consult their doctors and a nutritionist when making decision about which foods to eat or avoid. Note that in many cases, people with ABL develop an aversion to fats and self-limit fat intake. A low-fat diet can improve gastrointestinal problems such as diarrhea, pain, and steatorrhea (fatty stools). ABL is an autosomal recessive disorder caused by mutations in the gene MTP (reviewed in reference 1). The term autosomal recessive means that the disorder is passed on when both parents contribute a copy of the mutated gene to their child. The link at the right provides information about labs that test for mutations in MTP. MTP plays a role in transporting fats made in the liver and intestines. Fats can't dissolve in blood, so the body has to package them inside molecules that can dissolve in order to move them from one place to another. These molecules tend to be shaped like spheres. Fats stay in the center of the sphere, which has a structure that lets them dissolve. Meanwhile, the outside of the sphere has a structure that dissolves in the blood and can move freely without getting stuck. When MTP is missing or incorrectly formed because of a gene mutation, the intestines and liver can't transport fats. This is why people with ABL have fatty stools, a fatty liver, and problems digesting fats that they eat. They also can't digest vitamins that dissolve in fats, such as vitamins A, E, and K. This is why ABL patients must take vitamin supplements. Vitamin A is available in a water-soluble form. Vitamin E supplements must be taken in very large doses in order to overcome poor absorption. In some cases, vitamins may be given other than by mouth, such as by injection. If a person doesn't take supplement, neurological problems and vision loss will result. A low-fat diet is also important. It is therefore extremely important to have regular consultations with medical profressionals, such as doctors who specialize in the gastrointestinal system, and nutritionists. A combination of certain clinical features is highly suggestive of ABL. One set of features includes signs of fat malabsorption (chronic diarrhea, steatorrhea, and endoscopy of the intestine with what has been described as a "gelee blanche" or "white hoar frosting" appearance (6). The next set of features in the combination includes an abnormal blood lipid profile. Patients have low or absent cholesterol and triglycerides. They also lack ApoB, the protein made by the MTP gene. Finally ABL patients will also show a large percentage of acanthocytes in a blood smear. Note patients with a sister condition, familial hypobetalipoproteinemia, will also have this profile. The two conditions are treated in the same way. Adult patients, may also have neurological signs and problems with vision. Neurological problems tend to begin with reduced or absent deep tendon reflexes (e.g. knee jerks) and loss of balance when their eyes are closed (Romberg's sign). If ABL is not treated, it progresses and a condition called ataxia develops. This term means that the neurological system is not able to coordinate movement. For example, walking is affected by gait ataxia --- patients develop balance problems that may become severe, the feet are held widely apart to help maintain balance, and the patient tends to stagger. The arms can be affected ask well: tremors develop, and a person may have trouble reaching for objects. This problem is tested by asking the patient to 1) touch an object being held at arm's length, such as a pen, 2) touch his nose, 3) repeat. People with ataxia will have difficulty with this process. They may also have trouble with rapidly alternating movements toe tapping or rotating their palms up and down (see video links above). They may also have difficulty sliding their heels up and down their shins, Ataxia affects speech (dysarthria); speech is slowed, slurred, and difficult to understand. People with ataxia may also have trouble swallowing foods or liquids. This condition is called dysphagia. Unlike the other forms of ataxia just described, dysphagia does not appear to a significant problem in ABL. Decreased ability to see in the dark is often one of the first ways in which sight is affected in ABL. Another common problem is retinitis pigmentosa (RP; see photos below).RP causes the cells of the retina to break down, making them unable to process light signals. Difficulties with night vision are the first sign of RP. Later, as more of the retina becomes affected, a person may develop tunnel vision (see photo), and develop severe visual handicaps. RP is irreversible. However, appropriate and continued treatment (especially with vitamin supplements) can delay, prevent, or diminish these problems. Hypobetalipoproteinemias (HBLs). The HBLs are a pair of disorders that cause low or absent levels of apolipoprotein. They are called homozygous hypobetalipoproteinemia (HHBL) and familial hypobetalipoproteinemia (FHBL). ABL and HHBL are indistinguishable clinically (6, 8), but a key difference is that parents and sibling carriers of HHBL patients have low levels of total cholesterol, LDL cholesterols, and triglycerides. This is not the case with ABL. While treatment for the ABL and HHBL is the same (8), they can be distinguished by gene sequencing and by finding low levels of blood lipids in parents or other family members. The gene APOB is mutated in HHBL. FHBL is less severe than ABL or HHBL. People with this condition have one mutated copy of APOB, the gene that is mutated in HHBL, and one functioning copy. Patients have low levels of lipids in the blood, but do not appear to develop the neurological problems and loss of vision that occurs in ABL and HHBL (8). Like ABL and HHBL patients, people with FHBL can have liver problems. They also have a higher risk of developing liver cancer. Some patients develop cornary artery disease (8). Ataxia with vitamin E deficiency (AVED). Like ABL, people with AVED have very low levels of vitamin E in their blood. As a result, the two conditions share many clinical features. They include neurological problems, such as balance problems and gait ataxia, tremors and disabilities with fine motor skills due to ataxia, and loss of reflexes. Other problems in ABL and AVED include high arches, spinal curvature problems such as scoliosis, retinitis pigmentosa, and cardiomyopathy (9). A key difference between the two disorders is that fat absorption is normal in AVED and abnormal in ABL. As a result, the consistent gastrointestinal problems that are key features of ABL are absent in AVED. Another important feature of ABL that distinguishes it from AVED is the presence of star-shaped red blood cells (acanthocytosis; see photo on this page). These cells do not occur in AVED, and are obvious on a blood smear. Like ABL, AVED can be treated with vitamin E supplements (800-1200 mg per day; 2). Improvement of some symptoms can occur after treatment is begun, and no new problems appear during treatment (2). In addition, if treatment is begun in affected younger siblings of an AVED patient, the siblings may not develop signs of disease. Because AVED is a treatable condition and because it is so similar to ABL, it is critical to test for it in any patient with ataxia. An analysis of serum vitamin E concentrations (low in ABL and AVED, normal in FRDA) and lipoprotein profiles (normal in AVED; abnormal in ABL) can help distinguish the two disorders. In addition, genetic sequencing is definitive, as AVED is caused by mutations in a gene called TTPA. Friedreich ataxia (FRDA). ABL and FRDA share many similarities, including those listed for AVED above (neurological problems: balance problems and gait ataxia, tremors and disabilities with fine motor skills due to ataxia, loss of reflexes, high arches, blood sugar problems, etc. ; see FA page for a more complete list). The key distinguishing feature between them is that levels of serum vitamin E are normal in FRDA, and low or very low in ABL. Additionally, retinitis pigmentosa is rare in FRDA. In addition, ABL occurs in east Asians (e.g. people of Japanese origin), while FRDA has not been observed in these populations. Another important feature of ABL that distinguishes it from FRDA is the presence of star-shaped red blood cells (acanthocytosis; see photo on this page). These cells do not occur in FRDA, and are obvious on a blood smear. Gene sequencing can also distinguish the two diseases. In summary, any person suspected of having Friedreich ataxia or any other form of ataxia should be tested for vitamin E deficiency. Before diagnosing FRDA, it is critical to rule out conditions like ABL, AVED, and HBL because, unlike Friedreich ataxia, ABL, HBL, and AVED are treatable. Core neuroacanthocytosis syndromes (NAs). 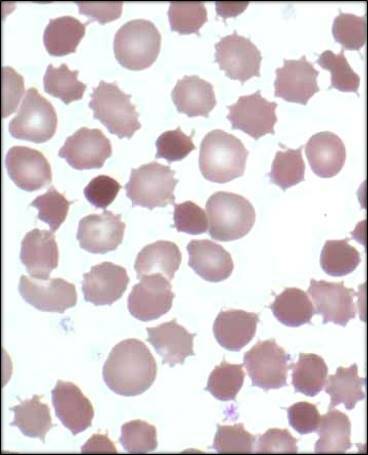 The members of this group of diseases share two characteristics with ABL: acanthocytes (see photo above) and neurological abnormalities. These syndromes were formerly called Levine-Critchley syndrome (reviewed in 10). While red blood cell appearance is identical in the core NAs and ABL, these conditions are relatively easy to distinguish from ABL because lipid metabolism is normal in the core NAs and abnormal in ABL, and because many individual neurological abnormalities differ between them. For example, people with NAs have movement disordesr that resemble those in Huntington's disease. They may also have psychiatric problems. Absent or diminished deep tendon reflexes are common to both ABL and the NAs, however, as is liver disease. Refsum disease (RD). RD is a condition that causes problems with myelin in the brain. Like ABL patients, people with RD develop retinitis pigmentosa, peripheral neuropathy, and ataxia. An important difference between them is that loss of the sense of smell is very common to universal in RD (11), and does not appear to be a feature of ABL. In addition, people with RD may have abnormally short toes or fingers, and a minority of patients have ichthyosis, or scaly itchy skin. Symptoms of RD may develop in infancy, or not become apparent until age 50 (11). Celiac disease. ABL is commonly mistakenly diagnosed as celiac disease, especially in very young patients (for examples, see references 5, 12, & 13; reviewed in references 1 & 6). The gluten-free diet which is prescribed for celiac disease does not help relieve symptoms in ABL patients. 1. Kane JP (2001) Disorders of the biogenesis and secretion of lipoproteins containing the B apolipoproteins. The Metabolic and Molecular Bases of Inherited Disease, 8th edition Scriver CR et al., eds. New York, NY, USA, McGraw-Hill; 2717-2752. 2. Hentati F et al. (2012) Ataxia with vitamin E deficiency and abetalipoproteinemia. Handbook of Clinical Neurology 103:295-305. Abstract on PubMed. 3. Hammer MB et al. (2014) Clinical features and molecular genetics of two Tunisian families with abetalipoproteinemia. J Clin Neurosci 21(2):311-315. Abstract on PubMed. 4. Hasosah MY et al. (2010) Rickets and dysmorphic findings in a child with abetalipoproteinemia. Saudi Med J 31(10):1169-1171. Abstract on PubMed. 5. Nagappa M et al. (2014) Clinical, hematological, and imaging observations in a 25-year-old woman with abetalipoproteinemia. Ann Indian Acad Neurol 17(1):1113-1116. Full text on PubMed. 6. Lee J & Hegele RA (2014) Abetalipoproteinemia and homozygous hypobetalipoproteinemia: a framework for diagnosis and management. J Inherit Metab Dis 37(3):333-339. Abstract on PubMed. 7. Bishara S et al. (1982) Combined vitamin A and E therapy prevents retinal electrophysiological deterioration in abetalipoproteinaemia. Br J Ophthalmol 66(12):767-770. Full text on PubMed. 8. Welty FK (2014) Hypobetalipoproteinemia and abetalipoproteinemia. Curr Opin Lipidol 25(3):161-168. Full text on PubMed. 9. Schuelke M (2005) Ataxia with vitamin E deficiency. Updated October 13, 2016. GeneReviews [Internet] Pagon RA et al., editors. Seattle (WA): University of Washington, Seattle; 1993-2019. Full text. 10. Jung HH et al (2011) Neuroacanthocytosis syndromes. Orphanet J Rare Dis 6:68. doi: 10.1186/1750-1172-6-68. Full text on PubMed. 11. Wanders RJA et al. (2006) Refsum Disease. Updated June 11, 2015. GeneReviews [Internet] Pagon RA et al., editors. Seattle (WA): University of Washington, Seattle; 1993-2019. Full text. 12. Gorin MB et al. (1994) Angioid streaks associated with abetalipoproteinemia. Ophthalmic Genet 15(3-4):151-159. Full text from publisher. 13. Sperling MA et al. (1971) Abetalipoproteinemia: metabolic, endocrine, and electron-microscopic investigations. Pediatrics 48(1):91-102. Abstract on PubMed. 14. Hamel C (2006) Retinitis pigmentosa. Orphanet J Rare Dis 1:40. doi: 10.1186/1750-1172-1-40. Full text on PubMed. 16. AstroNomer (2003). Wikimedia Commons user. Supreme Court building on the Wikimedia Commons. Wikimedia Commons. 17. Piksteel (2009). Wikimedia Commons user. Supreme Court building and tunnel vision on the Wikimedia Commons. Wikimedia Commons. 18. Zamel R et al. (2008) Abetalipoproteinemia: two case reports and literature review. Orphanet J Rare Dis 3:19. doi: 10.1186/1750-1172-3-19. Full text on PubMed.